Your inner history buff will appreciate Pittamiglio"s Castle and Iglesia de las Carmelitas. You'll discover tucked-away gems like Cuchilla Alta and Bouza Bodega Boutique. The adventure continues: wander the streets of Pocitos, examine the collection at 1972 Museum, don't miss a visit to Plaza Independencia, and get a sense of history and politics at Estevez Palace. To see photos, ratings, other places to visit, and more tourist information, read our Montevideo trip itinerary maker app . San Francisco, USA to Montevideo is an approximately 20-hour flight. You can also do a combination of subway, flight, and ferry; or do a combination of flight and ferry. The time zone difference moving from Pacific Standard Time to Uruguay Time is 5 hours. Prepare for somewhat warmer weather when traveling from San Francisco in February: high temperatures in Montevideo hover around 81°F and lows are around 65°F. Wrap up your sightseeing on the 22nd (Fri) to allow time to drive to Colonia del Sacramento. Eschew the tourist crowds and head to Playa Santa Ana and Playa Fomento. Your inner history buff will appreciate Barrio Historico and Colonia del Sacramento Lighthouse. There's lots more to do: take in the pleasant sights at Rambla Colonia Del Sacramento, take a leisurely stroll along Muelle del Puerto de Yates, make a trip to Centro Cultural Bastion Del Carmen, and pause for some serene contemplation at Basilica De Santisimo Sacramento. To see traveler tips, maps, more things to do, and more tourist information, refer to the Colonia del Sacramento trip builder website . Traveling by car from Montevideo to Colonia del Sacramento takes 3 hours. Alternatively, you can take a bus; or do a combination of flight and ferry. In February, daily temperatures in Colonia del Sacramento can reach 81°F, while at night they dip to 67°F. 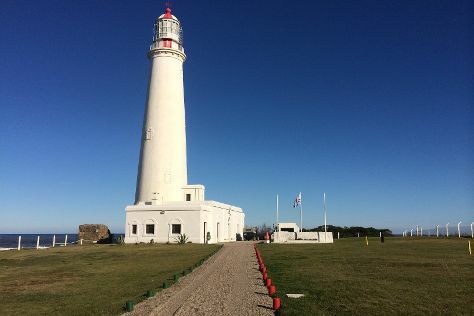 Wrap up your sightseeing on the 25th (Mon) early enough to drive to Cabo Polonio. 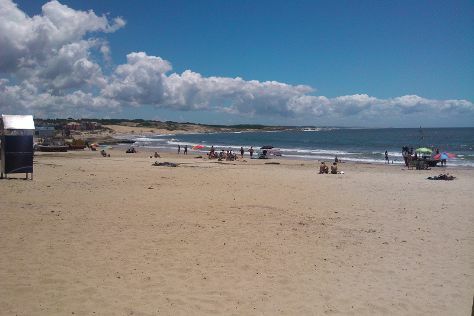 Kick off your visit on the 26th (Tue): stroll through Beaches at Cabo Polonio. On the 27th (Wed), you'll have a packed day of sightseeing: enjoy the sand and surf at Playa de la Calavera and then visit a coastal fixture at Lighthouse of Cabo Polonio. For traveler tips, more things to do, reviews, and other tourist information, read our Cabo Polonio trip planner . Traveling by car from Colonia del Sacramento to Cabo Polonio takes 7 hours. Alternatively, you can take a bus; or do a combination of bus and taxi. The time zone difference moving from Uruguay Time to Amazon Time is minus 1 hour. Wrap up your sightseeing on the 27th (Wed) to allow time to travel to Punta del Diablo. Start off your visit on the 28th (Thu): browse the eclectic array of goods at Pescaderia Punta del Diablo and then enjoy the sand and surf at Playa de Los Pescadores. On the 1st (Fri), you'll have a packed day of sightseeing: tour the pleasant surroundings at Playa del Rivero and then enjoy the sand and surf at Playa de la Viuda. To find other places to visit, where to stay, maps, and more tourist information, use the Punta del Diablo day trip planning tool . Traveling by combination of taxi and bus from Cabo Polonio to Punta del Diablo takes 1.5 hours. Alternatively, you can drive. Wrap up your sightseeing on the 1st (Fri) to allow time to take a bus to Rocha. 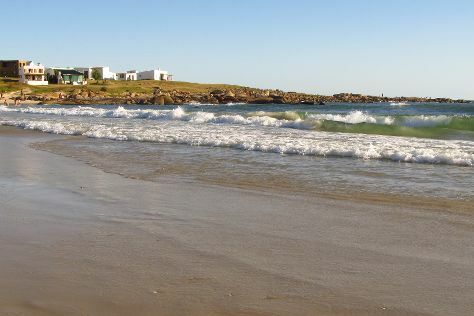 We've included these beaches for you: La Pedrera and Balneario Punta Rubia. Popular historic sites such as Faro Cabo Santa Maria and Fortress of Santa Teresa are in your itinerary. Step out of Rocha with an excursion to Playa Los Botes in La Paloma--about 32 minutes away. The adventure continues: enjoy the sand and surf at Playa Grande and snap pictures at Puente Circular. To see reviews, other places to visit, photos, and tourist information, read Rocha online vacation builder . You can take a bus from Punta del Diablo to Rocha in 1.5 hours. Alternatively, you can drive; or take a bus. Traveling from Punta del Diablo to Rocha, you'll lose 1 hour due to the time zone difference. In March, plan for daily highs up to 74°F, and evening lows to 65°F. 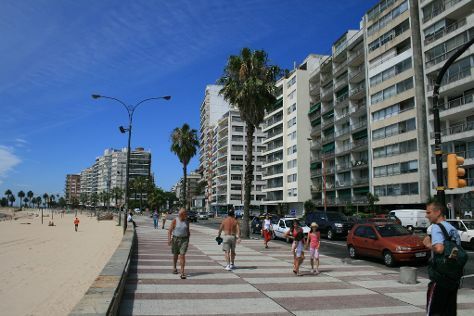 Wrap up your sightseeing on the 4th (Mon) to allow time to drive to Punta del Este. Your cultural itinerary includes sights like Ralli Museum and Museo - Taller de Casapueblo. Discover out-of-the-way places like Playa de Jose Ignacio and Playa Mansa. Take a break from Punta del Este with a short trip to Cerro San Antonio in Piriapolis, about 48 minutes away. There's lots more to do: see the interesting displays at Museo del Mar, kick back and relax at Praca Los Ingleses, stroll through Playa Portezuelo, and take some stellar pictures from Mirador Punta Ballena. To find more things to do, reviews, photos, and other tourist information, use the Punta del Este day trip planner . Traveling by car from Rocha to Punta del Este takes 1.5 hours. Alternatively, you can take a bus. In March, daily temperatures in Punta del Este can reach 74°F, while at night they dip to 65°F. Wrap up your sightseeing on the 8th (Fri) early enough to travel back home.